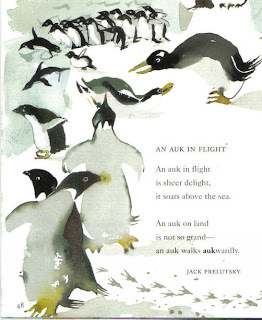 For Poetry Friday a poem on the auk by Jack Prelutsky my fine auk-quantance at Greenwillow Books where we worked with Susan Hirshman and now create with Virginia Duncan. The expressive illustration is by the talented artist Meilo So. Poem and painting are from The Beauty of the Beast: Poems from the Animal Kingdom (Knopf) 1997. Poem Copyright 1990 Jack Prelutsky. Art copyright 1997 by Meilo So. it soars above the sea. Nor do auks tauk much! Okay, stop now before I dig any deeper. Thanks for sharing some Jack this morning. Excellent. Auks are Great! I really like the illustrations by So. I posted about Errol Le Cain on my blog the other day when I learned he had illustrated a few of T.S. Eliot's "Old Possum's Book of Practical Cats". I just went to see Webber's CATS for the first time on Monday night. I've always liked Prelutsky poetry. When I was in college, I wrote a big report on him for my Children's Literature class. I wish I'd saved it! I love puns in poetry! I'm a glutten for Pun_ishment! And some of my best friends pun, too! Nothing like Prelutsky to brighten one's day :). 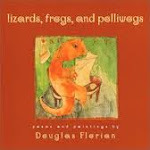 I can't wait to use Prelutsky's new book, Pizza, Pigs and Poetry with my students. 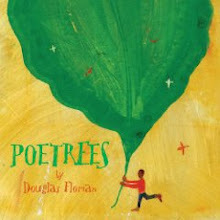 There's nothing like a guided tour inside a poet's process and poems. He's a penguin in disguise. Chauk one up for Laurie! Oh, I feel like aupologizing now. 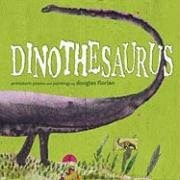 My kids and I adore Prelutsky's work and have a couple of his books! I'm always reminded of the great Ogden Nash when I read Jack's poetry. Thanks for sharing this one! Hope you had a lovely weekend! Fun wordplay--love the unexpectedly delicate art! Great weekend Teresa, except for 10 inches of snow. Laura you could say the art was SO delicate. I needed cheering up just then. You waved the magic wand. Thanks.